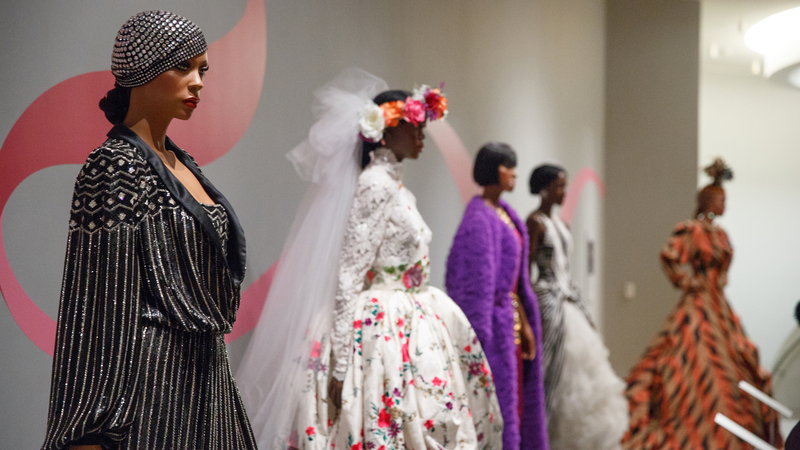 Video: Memories of Ebony Fashion Fair in D.C.
Celebrated Ebony Fashion Fair Audrey Smaltz joined Curator of Contemporary Art Camille Ann Brewer to share the stories, styles, and impact of the fashion fair on D.C. fashion identity. A collaboration with the Smithsonian Anacostia Community Museum. 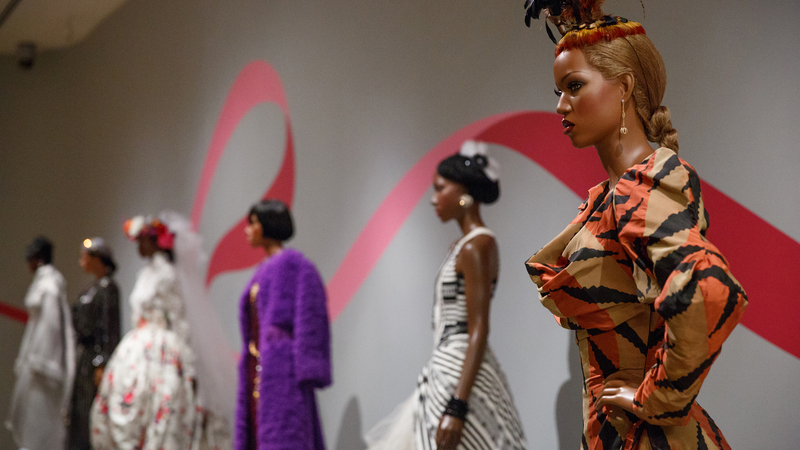 For fifty years, the Ebony Fashion Fair shaped a new vision of black America through contemporary fashion. 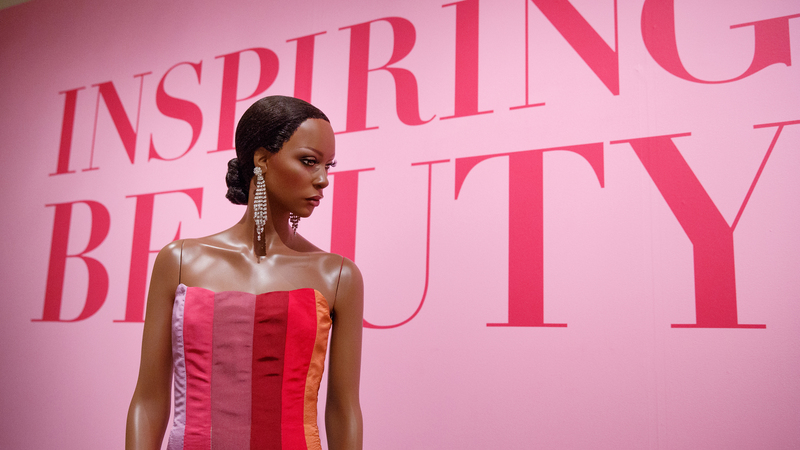 This exhibition of stunning ensembles by leading designers told the story of the fair’s creator Eunice W. Johnson, who overcame racial prejudice to bring global fashion to African-American audiences. 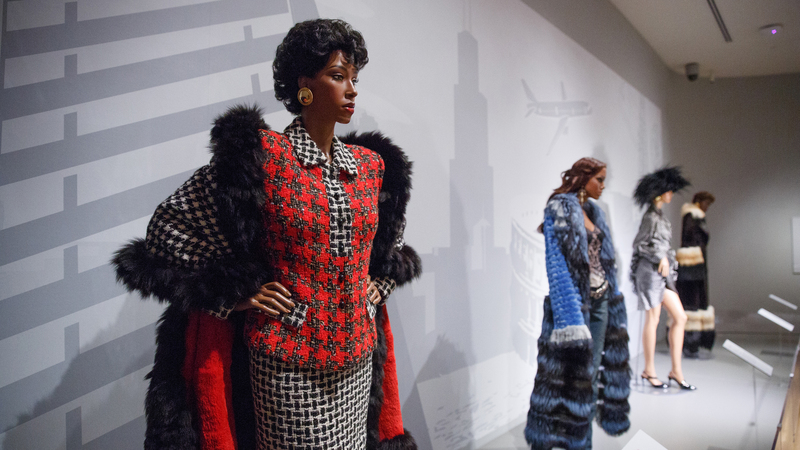 Developed by the Chicago History Museum in cooperation with Johnson Publishing Company, LLC, presented by the Costume Council of the Chicago History Museum, and toured by International Arts & Artists, Washington, D.C.
Inspiring Beauty: 50 Years of Ebony Fashion Fair from The George Washington University on Vimeo. 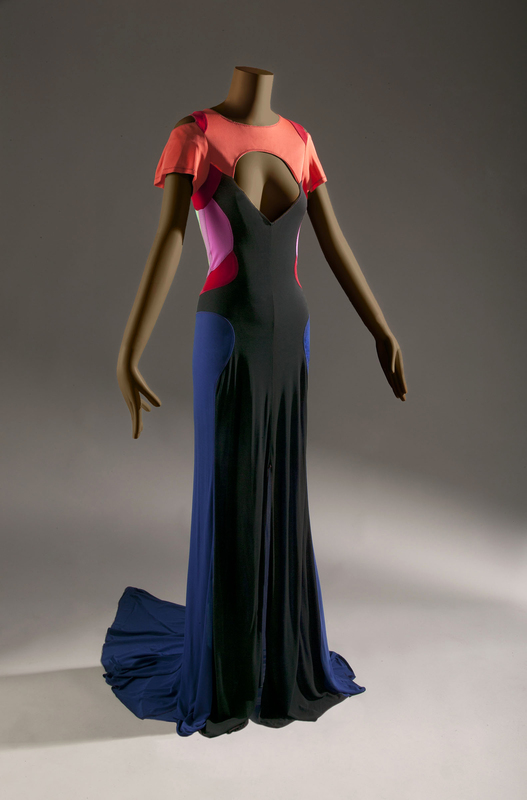 Stephen Burrows (United States), evening dress, ready-to-wear, spring/summer 2007. Rayon jersey. Appeared in Glam Odyssey. Photograph by John Alderson © Chicago Historical Society. 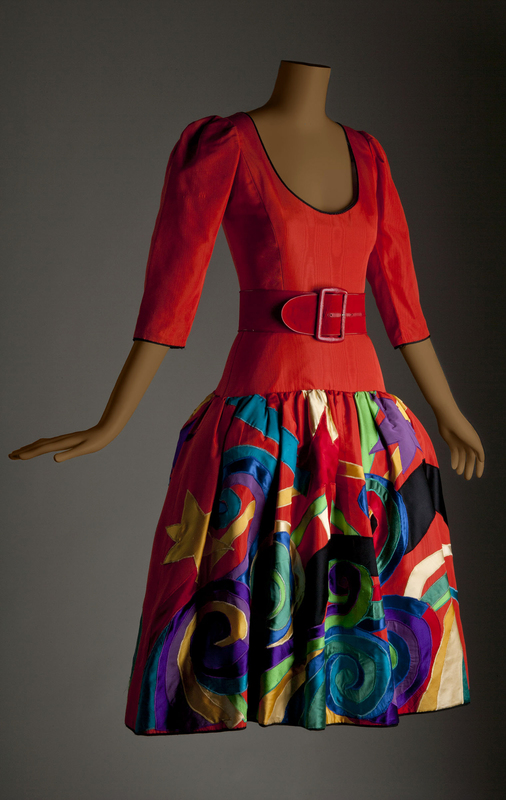 Tilmann Grawe (France), cocktail dress, special order, fall/winter 2003-04. Silk chiné taffeta, horn, plastic and glass beads, horsehair tubing, plastic boning. Appeared in Living It Up. Photo courtesy of Johnson Publishing Company, LLC. 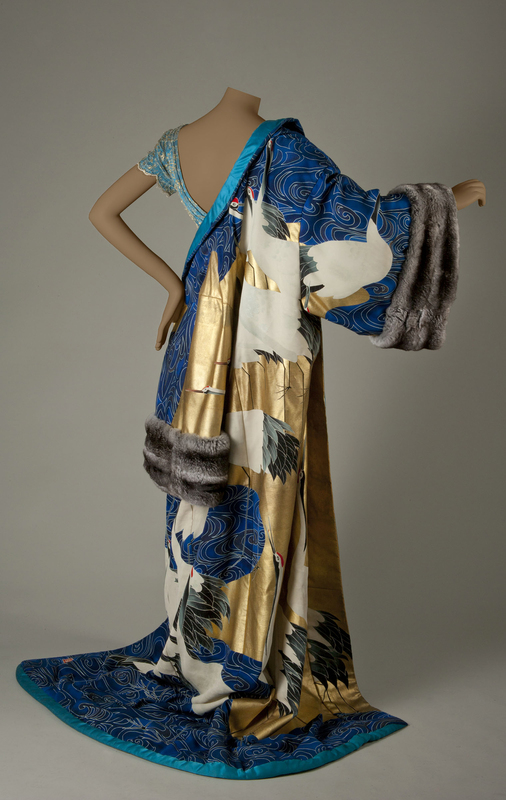 Yves Saint Laurent (France), ‘Picasso’ evening dress, haute couture, fall/winter 1979-80. 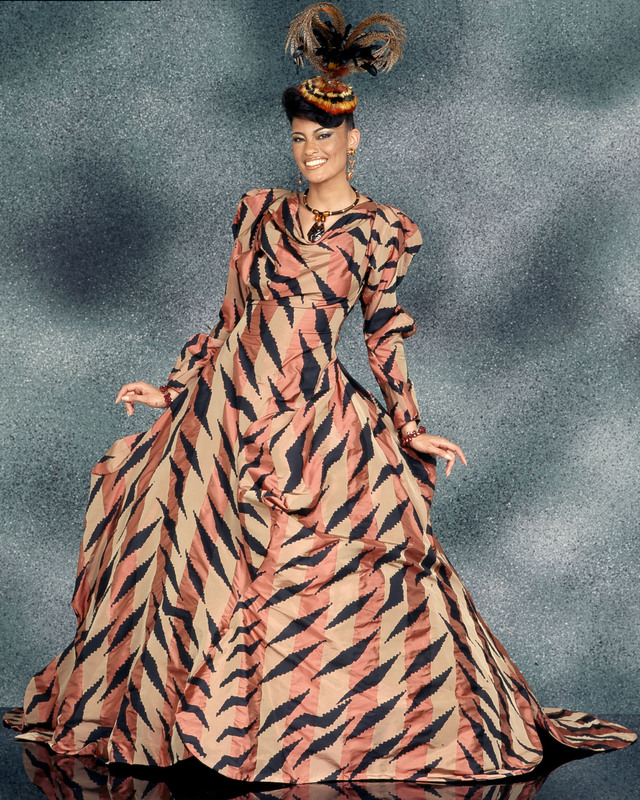 Silk moiré taffeta and satin. Appeared in Color Explosion. Photograph by John Alderson © Chicago Historical Society. 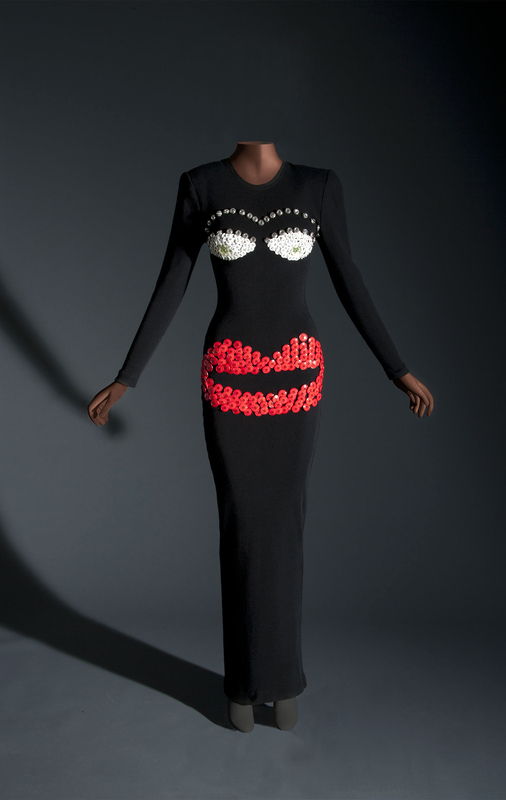 Patrick Kelly (France), “I love Fashion Scandal” evening dress, special order, fall/winter 1986. Wool knit, plastic buttons. Appeared in Fashion Scandal. Photograph by John Alderson © Chicago Historical Society. 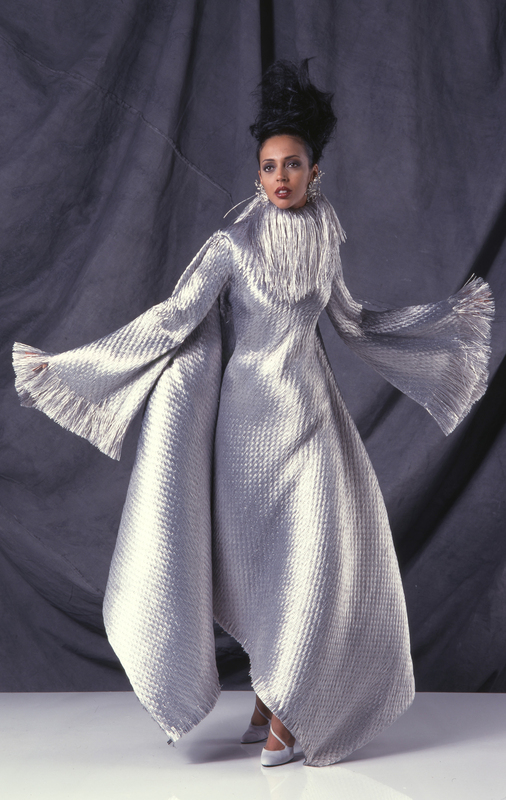 Chloé (France) by Karl Lagerfeld, evening dress, ready-to-wear, fall/winter 1983-84. Acetate/rayon blend, glass beads and rhinestones, plastic sequins. Appeared in Fashion Extravaganza. Photograph by John Alderson © Chicago Historical Society. 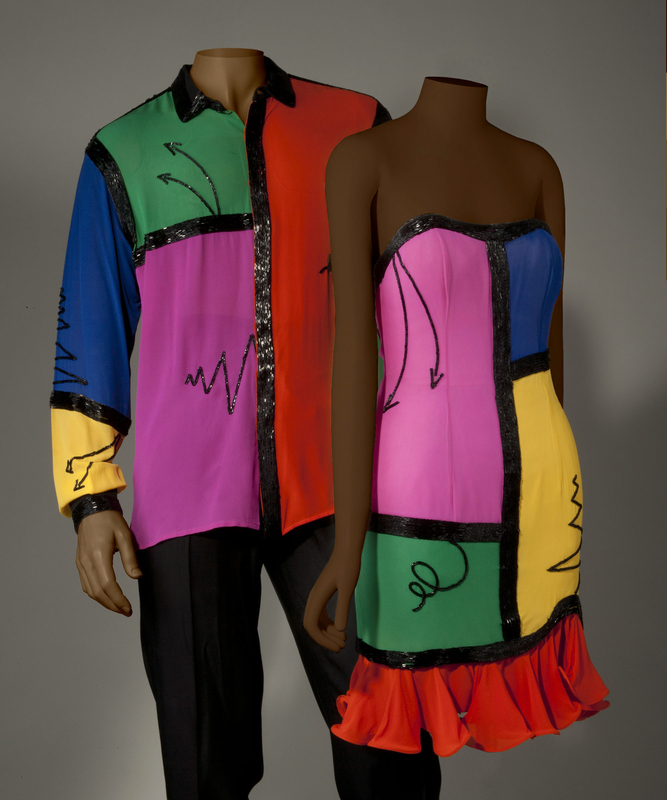 Fabrice (United States), cocktail dress and men’s coordinating dress shirt, ready-to-wear, spring/summer 1990. Silk crepe, glass beads. Appeared in Freedom Explosion. Photograph by John Alderson © Chicago Historical Society. 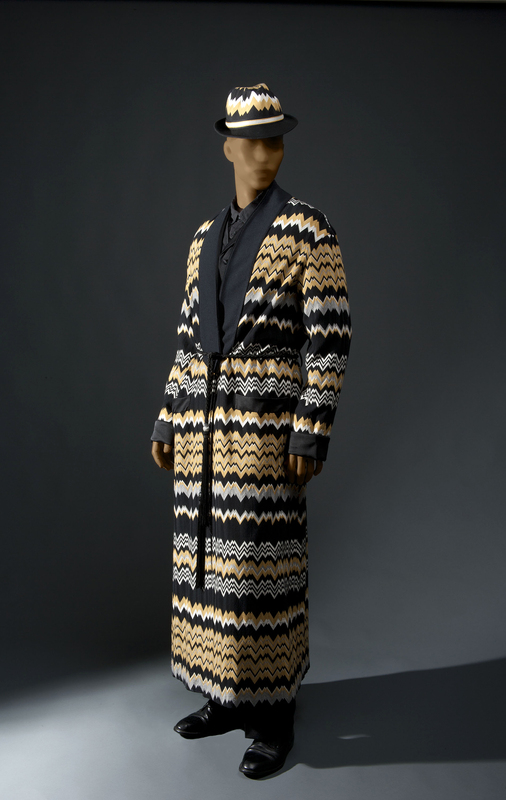 Missoni (Italy), day ensemble, ready-to-wear, fall/winter 2006-07. Wool/nylon blend chevron knit. Appeared in Stylishly Hot. Photograph by John Alderson © Chicago Historical Society. 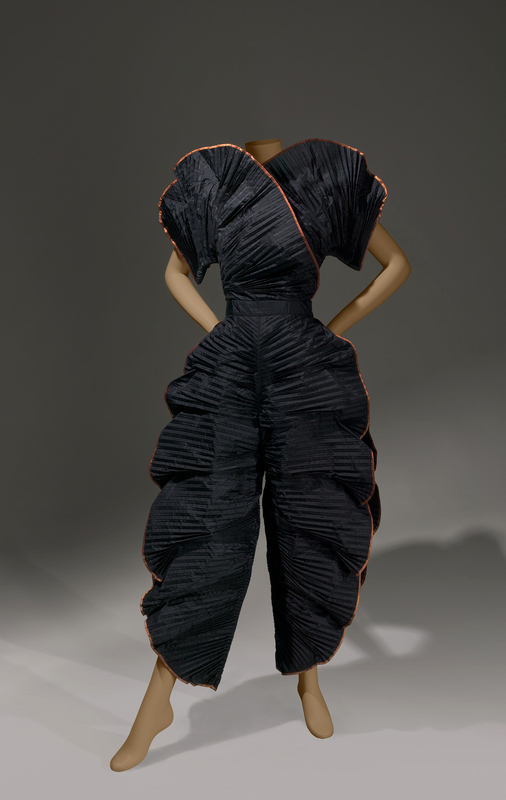 Krizia (Italy), jumpsuit, haute couture, fall/winter 1981-82. Silk taffeta and satin. Appeared in The Look of Elegance. Photograph by John Alderson © Chicago Historical Society. 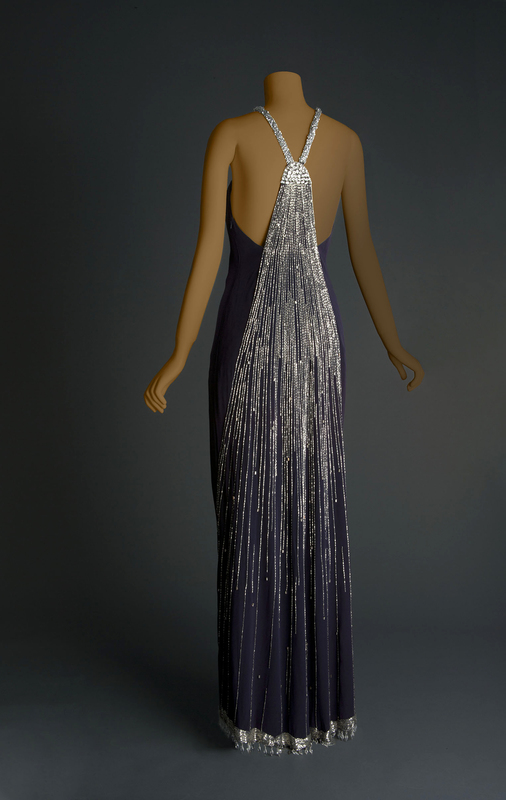 Givenchy by Alexander McQueen (France), evening dress, haute couture, fall/winter 1997-98. Synthetic raffia mounted on silk gauze. Appeared in The Jazz Age of Fashions. Photo courtesy of Johnson Publishing Company, LLC. 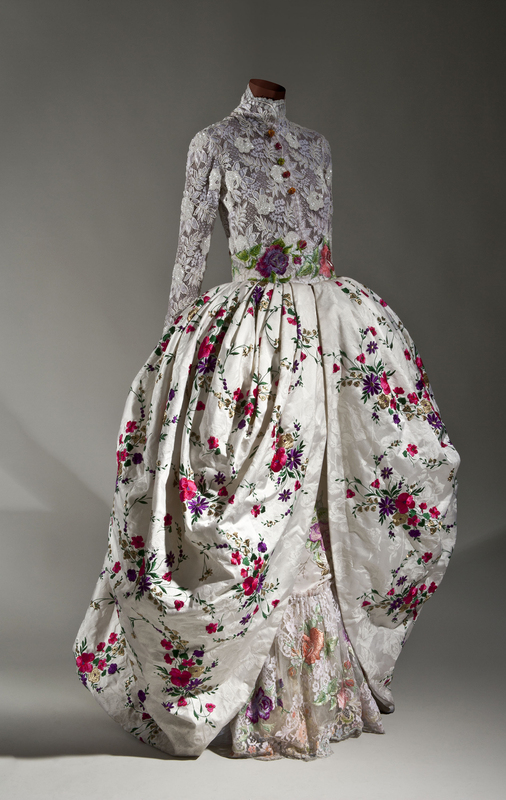 Vivienne Westwood (United Kingdom), ball gown, special order, fall/winter 2002-03. Silk ribbon taffeta with hand-silkscreened print. Appeared in Simply Spectacular. Photo courtesy of Johnson Publishing Company, LLC. 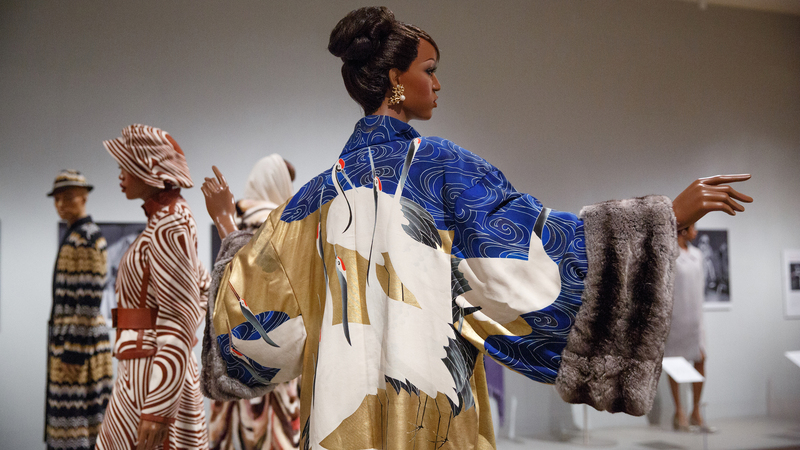 Hanae Mori (Japan), evening ensemble, haute couture, fall/winter 2001-02. Corded silk, gold-leaf, silk satin, metallic lace, chinchilla. Appeared in Changing Trends of Fashion. Photograph by John Alderson © Chicago Historical Society. Emmanuel Ungaro (France), bridal gown, haute couture, fall/winter 1996-97. Cotton/synthetic blend lace, embroidered silk, plastic ‘pearl’ beads and sequins, glass beads. Appeared in The Great Fashion Mix. Photograph by John Alderson © Chicago Historical Society. 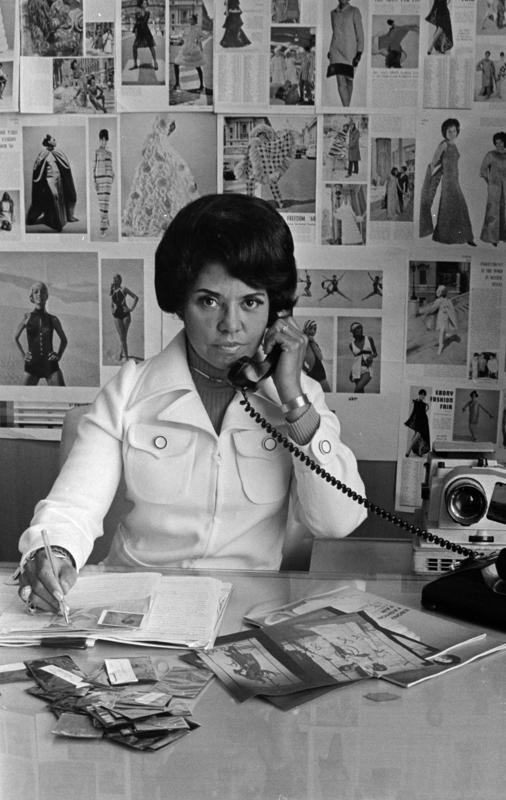 Eunice Johnson at work, 1970. Photo courtesy of Johnson Publishing Company, LLC.